There's a lot of new and exciting things happening in downtown Winston-Salem, one of the most noteworthy being the new Kimpton Cardinal Hotel in the former RJ Reynolds building. The Cardinal is both hotel and residential, and has a swanky, old-school vibe. When I walked into the hotel's French restaurant, The Katherine Brasserie, it immediately reminded me of the cafes I stumbled upon in Paris. 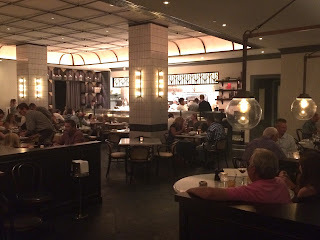 The ambiance is quite authentic, including the noise level, which I quickly got used to. 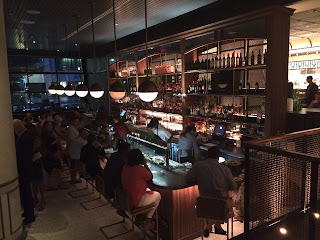 The bar isn't just for fabulous cocktails, it's also a raw bar with oysters being shucked right alongside the squeezing of limes. It's a new addition to downtown, and it was packed, as you would imagine. Service is excellent - my glass water was never empty - and there are several people looking out for you and making sure you have a great experience. The Katherine's cocktail list offers both house creations and classic renditions. You'd be wise to start with one. Housemade brown sugar simple syrup makes the already tasty Mint Julep even more special. Warm French bread is served with soft, salty butter and ties you over as you await one of their delicious starters. The Baked Escargot seemed like the most obvious choice, and we were intrigued by the Southern twist. Six tender snails are served in an herbaceous butter they call the Maitre D'Butter, which on its own is a flavor bomb. 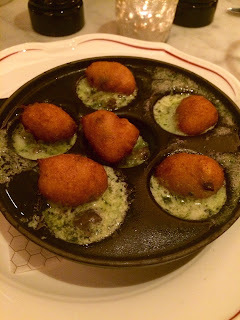 The best part is a slightly sweet hush puppy that tops the escargot! Break open the hush puppy to absorb even more of the slightly briny, garlicky butter. I saw several orders of this being taken to tables throughout the course of the evening. This is one of their signature dishes, and it is a hit. 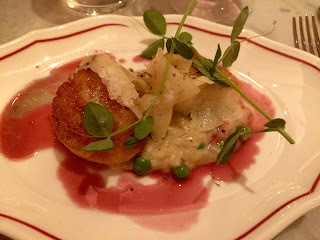 Though not an entree, I had my eyes on the Seared Sea Scallops from the moment I looked at the menu. Tender, plump scallops are cooked perfectly (one of the best things in the world!) and they sit atop a black truffle and english pea risotto, and drizzled with beurre rouge, a tangy pink sauce. The risotto is luscious and rich, and peas are the perfect color and texture addition to this dish. I wish this had been an entree portion, but it is so decadent that it's probably best to remain an appetizer! I paired the scallops with another small plate saturated with truffles - do you see a theme here? (Longtime C&S readers will remember that I'm obsessed with anything that has truffles.) 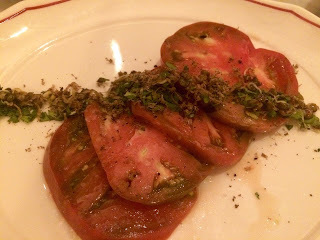 The Heirloom Tomato Salad seemed seasonally perfect. Thick, meaty and ripe tomatoes are scattered with persillade (parsley and seasonings), lentils, shaved summer truffles, and the most fabulous truffle vinaigrette. I couldn't help but dip my bread in the remaining vinaigrette that lingered on the plate. The Bistro Filet is 8 ounces and $21, as opposed to the Filet Mignon, which is 10 ounces and $38. I was eager to see if the Bistro Filet would be as tender and flavorful as the always fabulous Filet Mignon - and it was! It had a savory crust, and was a perfect medium rare. Accompanying sauce options include Bearnaise, Bourbon Peppercorn, Red Wine Jus or a $5 supplement Foie Gras sauce. The Red Wine Jus was tangy and paired nicely with our Cabernet and the natural flavors of the filet. Sides are traditionally frites, but you can substitute for other tasty offerings, like the Jalapeno Creamed Sweet Corn. I detected more sweet notes than spicy ones, but it was still a hearty and flavorful dish. I'm very impressed with this place, and I'm thrilled for all the excitement surrounding Winston these days. I'll definitely return to The Katherine, but I better hurry before there's a 6 month wait in reservations!